Of course, I never communicated that. I just assumed that he could read my mind and know that those fifty times I told him in our first decade of marriage to NEVER buy me flowers didn’t count any more. So, if this were to ever happen to any of you sweet ladies, here is how you handle the situation, which is exactly how I did (cough, cough). Accept the flowers with appreciation and gratitude. Enjoy the beauty for two days. Then when they kick the bucket prematurely, like these wilting roses, cut them off at the very top of the stem, and float them in beautiful, white milk glass bowls where they will perk right up. 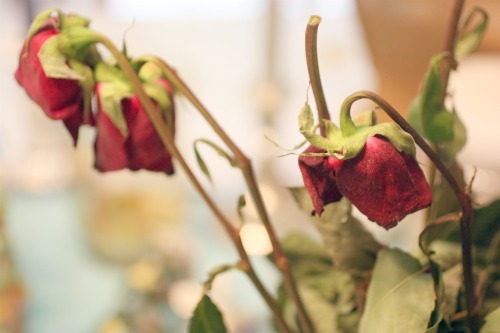 Yes, the life of those poor, dead roses will be extended for nearly another week, which gives your frugal soul plenty of time to decompress, and thoroughly appreciate the thoughtful gesture. So, let’s dish flowers…to give or not to give? I know to many of you flowers communicates love. I so appreciate how everyone’s “love languages” are different. Do you love to receive flowers? I had fake flowers at my wedding too… and yo know what? My bouquet is just as beautiful now as it was 15 years ago (15 years ago next Tuesday). I did pay extra to get high quality artificial flowers, though I think I’ve gotten my money back out of them by being able to admire my flowers nearly every day for a decade and a half. I will have to try floating the daisies I got for mothers day… maybe that’ll help them, they’re pretty droopy. I always told my husband when we were dating to never buy me red roses…especially around Valentine’s Day. 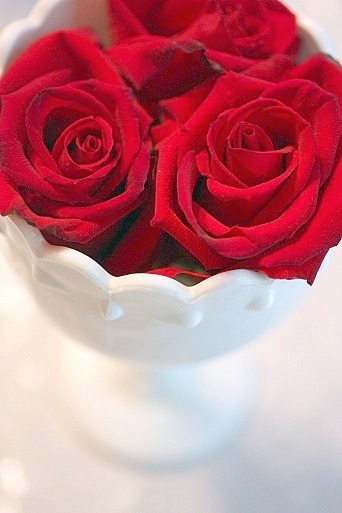 I love red roses, but they aren’t my favorites. I’d much rather get a different color; in fact, my favorites are the ones that are an orange/yellow color and the deep rust colored ones (my bridal bouquet). At our wedding, the bridal party had fresh flowers, but everyone else had silk flowers that my mom and I made into corsages/bouts and arrangements. Saved us a lot of money! I feel the same way. Isn’t it funny how we communicate exactly the opposite of what we really desire, only to find out that when we get what we want, it isn’t really what we wanted after all. Oh my…I can relate to this *hypothetical* scenario. My poor husband! Now that I am older and hopefully wiser, I feel differently about cut flowers also. I still resent when they are super expensive. I want to grow more of my own when we move. That is my potential solution. Thanks for the idea on lengthening their beauty and the reminder to receive gifts with gratitude and grace beyond our natural bent toward frugality! Might I suggest somthing other than roses. Carnations and mums last well past a week-especially if you change the water and trim the stems every few days. I am a lover of flowers. Thankfully, my husband knows about my love and indulges me. I, too, told my husband not to waste money buying flowers. We also had the problem of our cats wanting to chew and destroy the bouquet. Any flowers I received had to be locked behind a bathroom door. Truly not worth the money. But now the cats are gone and I find myself longing for flowers on my kitchen counter. I would be fine with flowers from the garden or an inexpensive bouquet. It’s time to give my hubby the update because he’s never learned the art of reading my mind. LOL! I’m the exact same way. I’ve always told my husband not to get me flowers, and I had fake flowers at my wedding also (although mainly to help a friend of the family who was doing the flowers for me). However, a couple of weeks ago, my husband completely surprised me for our anniversary/Mother’s Day with a beautiful bouquet (using one of our vases…he’s frugal too!). I discovered that I LOVE to be surprised with flowers occasionally…especially a bouquet with at least one flower that has a wonderful scent (I think it was a lily?). That EXACT scenario happened to me, including the hypothetical comment but without the frugal tip of shallow glasses of water. I prefer flowers BECAUSE they die! Yes, it seems wasteful to spend money on something that will die in a few days. But I can get a good quality bouquet that will last up to two weeks for about $20 at my grocery store. Once they die, I can get rid of them. I don’t have to find storage space for them. I don’t have to dust them. They don’t clutter up my house. I don’t need any more stuff. So flowers are perfect. One thing to extend the life of your flowers is to change the water in the vase daily or at least every other day. When you change the water, trim the end of the stem. This keeps the end freshly cut, which will allow the flower to drink more water and stay vibrant longer. Yes, they’ll get shorter as time goes on, but it’ll help you get your money’s worth! My mother told me a story once. When she and my Dad had their first child, my oldest brother and she was in the hospital my father brought her beautiful roses. She had never told him not to buy her flowers. Had never even thought to mention it because she felt it was out of the budget. She was so worried about the budget that she scolded him for spending the money on them. When other people came to visit they commented on the extrodinary bouquet. My mother realized that in a time and society where outward shows of affection were frowned upon the roses declared his love for her without words. She would have taken that away from him if she had thought to stop it before it happened. My husband seems to intuit that I prefer mixed bouquets, and he seldom gives me roses, though it’s never been a frugal/not frugal thing. I’m so with you on this issue. I had silk flowers at my wedding (2nd) for me and our girls. They were beautiful! I finally told my DH that an occasional flower is ok but I actually prefer carnations which last longer. Or the hibiscus plant he bought me and now sits on my deck and is huge, bringing me continuous flowers. I would rather have a dandelion that my son picks from the yard than a rose from my husband. In our house they get destroyed by kitten paws and baby hands far too quickly. I too don’t like to receive roses because of the cost and they don’t last. Instead, for my birthday and Mother’s day , I receive rose bushes. Talk about the gift that keeps on giving! I now have a rose garden and cut roses in every room of my house, plus I give roses to family and friends. Although very occasionally, he does get me a carnation or something, and I always treasure it for however long it lasts. My husband has always bought me flowers. They are safe gift when he can’t think of anything else. He’s not too imaginative, even when I leave hints. But after 29 years of marriage, I think he is running out of ideas. I am the exact same way. I think flowers are a waste of money, and I told my husband when we were dating that he shouldn’t buy any for me, and we had fake (but beautiful) flowers at our wedding. I still think flowers are unnecessary, because I know he loves me regardless, but he surprised me with a pot of daisies on Mother’s Day. Smart guy, because I can plant them and enjoy them for much longer than if they were a simple cut bouquet. I am the same way. The best Mother’s Day present ever was when they planted me a flower garden with a bunch of perennials. Now those are my kind of flowers. I LOVE to receive flowers and more than I love to get them my husband LOVES to buy them. I have to tell that for my 50th birthday he went to buy me- yep, you guessed it- 50 red roses! When he went to check out (at Jewel) they told him the roses were buy 1 get 1 free so he came home with 6 DOZEN roses!!!! But before you faint at the extravagance you have to remember that he really only paid the price of 3 dozen. I am sure that seems extremely wasteful to many of you but it spoke volumes to me! And because I know my husband I would only expect that he would get the exact number of 50 which required 5 dozen because the 48 from 4 dozen wan’t quite enough!!!! And I have to say that I dried about 20 of them so I could remember his act of love for a longer amount of time! Absolutely not wasteful one bit. We all have those special things that speak love to us, and this is yours. Your sweet man knows it and I love hearing your story. I’ve never told my honey not to buy me roses or any other flower either.. I love any & all flowers and plants.. I’ve been told my house looks somewhat like a greenhouse because they seem to multiply all by themselves..
Here’s a funny ‘frugal’ flower story for you. Yes, I love flowers, carnations are my favorite and sometimes my husband indulges me and happily carnations are relatively cheap and last a long time, that said, my favorite time that my husband brought me flowers was when he was getting gas and looked down into the trash can to see that the gas station had thrown out it’s nearly dead flowers and brought them home to me. I laughed, told him he was a cheapskate, and trimmed the stems, and loved them! Thanks for bringing that memory back!! My husband and I don’t have these problems. The reason being because every bouquet of roses he would buy for me would wilt within about 1 1/2 – 2 days. I don’t know, I’m guessing he has too much acid in his body or something! But, the bottom line is that I asked him to please, not buy me flowers anymore. Granted, he did buy me some bulbs to plant soon. But, I think he told me that our daughter picked them up, so he didn’t have to, lol! And, as per my comment on we don’t have these problems, it is because I believe in saying what you mean, and meaning what you say. I have never played “head games” with him. If I change my mind, or come up with a better way, I let him know. I don’t expect him to read my mind. It makes life SO much easier. We both know where we stand on things like this. My husband has surprised me with roses a few times and when they start to wilt, I hang them upside down to dry. I now have several bouquets that I still am enjoying! I have good success with roses because each day I trim the ends off and put them in fresh water and one of those little packets of flower food or whatever it is. If you do this, they will last much longer. Also, carnations last a long time and so do orchids. It only takes one long stemmed orchid which is not that expensive and if you keep trimming the end and using fresh water, I’ve had one last 2 weeks or longer. I love real flowers in my house. I don’t have any fake ones. I’d rather have a green plant than a fake flower. A single sunflower lasts a long time too, again w/the trimming and fresh water. I have taken the fresh flowers that our church was ready to discard to the trash, brought them home and trimmed and had them last 4 or 5 more days. As for my wedding oh so long ago, we mostly decorated with live caladiums with the pink in them. My bouquet and that of my only attendant were fresh roses. Simple, real, beautiful. I love to *give* them, and yes I nip’em & float ’em after a couple of slanted stem clips&water changes (workd for a florist on college breaks). But to *get* them? Ex never did, he figured I planted 36 roses for a reason&we always had fresh. I did have live for wedding, from florist I worked for-tho he cud hv done silks. They just smelled heavenly….aromatherapy for a wacko day. And I got a half dozn for momma from daddy (on sale! Cudnt hv gotten silks for that) and mom just kept sniffin’&grinnin’–soooo worth it. The aroma, the joy on her 89yo face…yeh, i’ll do it again. You know, if you will add an aspirin (NOT Tylenol, or Motrin…JUST PLAIN ACETOMINAPHIN) in the water, and cut just a bit off the bottom of the stem (1/2 inch) before you put them in the vase, they will keep alot longer. Change the water daily – yes, add an aspirin each time. When my husband gives me flowers they last a week, and sometimes longer. I have heard a tiny bit of bleach does the same thing, but have never tried it! @Kay M., Sorry, I meant or Acetominaphin…it just needs to be an aspirin. Oh my, that says it all. I love to get fresh flowers, but they can be from the yard or a just 1 or a few. A few drops of glycerin helps keep them fresh much longer, and works well for fresh Christmas trees, too. I also do not have storage space, so prefer the fresh ones that can be thrown away. I also prefer the wonderful smell of very fragrant flowers. Sometimes I will take a photo of them, and can look back at the photo and remember the special day and person who gave them to me. I don’t get them from my husband, but from my mother, mother-in-law, and sister. I guess none of the men in our family are flower givers, so we sort of spoil each other that way. I to am frugal when it comes to buying flowers. When my husband and I were dating he would get me a dozen roses for every special occasion, I would enjoy them until they started to get droopy and then I would dry them. When we got married I had all the dry petals and threw in some fresh ones for good measure and my flower girl threw them down the aisle. Now that we are married almost 9 years I don’t get flowers to often, mostly because I would prefer a rose bush or a plant but, when I do get fresh flowers I shower my husband with great adoration as he went out of his way to think about me.